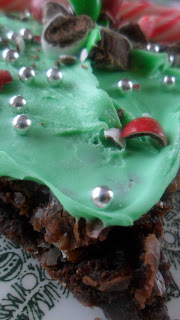 Cool Chocolate Mint Brownies are delicious. Chocolate and mint are made for each other. One of my favorite flavor combinations is chocolate and mint. I love anything chocolate and mint. Mint m & m’s in my opinion are heavenly. They have got to be one of my greatest weakness, mint m & m’s or should I say m & m’s in general are a weakness of mine. Apparently, mint m & m’s are also my grandsons weakness too. When my grandson was about 2 years old, I found him sitting on top of the dinning room table, helping himself to the candy dish that was filled to the top with mint m & m’s. E-man had crawled up on the chair, onto the table and was sitting on top of the table munching away, popping one after the other into his mouth…by the time we had been the wiser, he had eaten 3/4 of the candy dish. We were just glad he didn’t choke or get sick. Packed full of mini chocolate chips, pecans and hot fudge ice cream topping these brownies have it all. 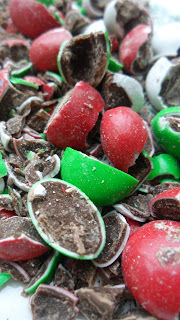 Add a mint frosting and chopped mint m & m's, fantastic! Heat oven to 350º Grease a 13 x 9 x 2 baking dish. Stir together cocoa and baking soda in large bowl, slowly stir in 1/3 cup melted butter. Add water; stir until mixture thickens. Add sugar, eggs, and remaining 1/3 cup melted butter. Stir until smooth. Add flour, extract and salt; combine until well blended. Stir in mini chocolate chips, mint candies, pecans and chocolate topping. Bake for 35 to 45 minutes or until toothpick inserted in middle comes out clean. Do not over bake. Cool pan on wire rack. When cool, frost with mint frosting. Cream butter, add confectioners sugar and beat. Stir in extract and milk. Mix until mixture is smooth and creamy. Add green food coloring, if desired, beat until reached desired color. Garnish with chopped mint m & m's. Peppermint Sourdough Biscotti . Another delicious recipe you’ll want to try is Raspberry Jello with Marshmallow Drizzle. Thanks for sharing these at Talking Tuesday Over the Fence! This looks delicious!!! Pinned for later…. Brownies are hands down my favorite too! Love how festive you've made them look. Mint and chocolate are my favorite behind chocolate and peanut butter! This sounds fantastic 🙂 Thank you for sharing at All my Blggy Friends this week! Yes, I have to agree, chocolate and peanut butter, very high on my list of favorite flavor combinations:) and Thank you for stopping by today to say "Hi"